On November 29, the tenth annual Writing Program Outreach Committee’s letter exchange project culminated in an on-campus event. 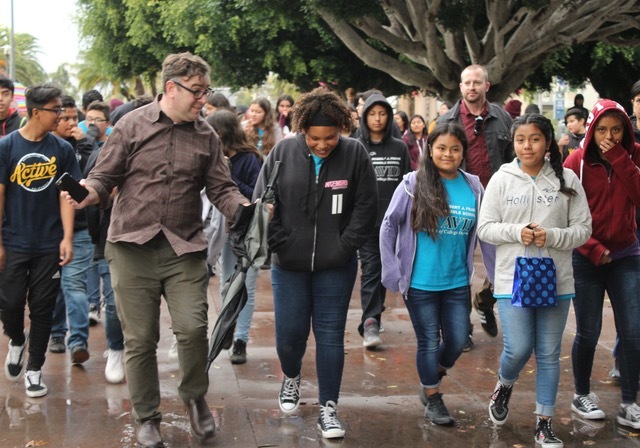 One hundred middle school students from the R. J. Frank Academy of Marine Science and Engineering (grades 6-8) in Oxnard joined UCSB students and faculty in Corwin Pavilion for a celebration of writing. The letter exchange project pairs Advancement Via Individual Determination (AVID) students from RJ Frank with current UCSB students. Throughout the Fall quarter, the AVID students exchange letters with students in Academic Communities for Excellence (ACE) writing classes as part of a program designed improve writing skills, enlarge perceptions about what counts as writing, and encourage academic achievement. This year, the letter exchange began with a visit at RJ Frank by UCSB writing faculty Jennifer Johnson and Nicole Warwick, who guided the middle school students through the writing process, welcoming them to the project. Beginning with a welcome from Writing Program Director Madeleine Sorapure, the dinner was both a celebration of writing and an opportunity for students and faculty to meet and to learn from one another. The event’s keynote speaker was UCSB student Candyce Wu, one of this year’s recipients of the prestigious Yolanda Garcia Award for Social Justice. In a powerful speech, Wu discussed her family history, which included her mother coming to the United States as a refugee from the Vietnam War. She encouraged the middle school students to believe in themselves, even in the face of challenges big and small. Importantly, she let them know that there are people and resources available to them to help them succeed on their paths. The grand finale was a series of readings from several letter-writing pairs, who generously shared their work with the audience. The letters were informative, but also funny, and even moving. These honest written exchanges made clear the connections that had been established between the two groups, and the power of writing itself. Starting with their writing, and continuing in person on campus, students were able to ask questions, express their hopes and fears, gain valuable insights about college life, and recognize their potential for success. The letter exchange project was coordinated by Writing Program faculty member and Community Outreach Chair Robert Krut with the assistance of RJ Frank AVID instructors Kristin Storey, Erika Alstot, Michael Gereau, and Gregory Packham. UCSB writing faculty Randi Browning, Chris Dean, Leslie Hammer, Kathy Patterson, and Nicole Warwick provided the UCSB letter writers and all took part in, and assisted with, the campus celebration. The event was funded by the Writing Program and Office of Education Partnerships. In recent years, the letter exchange project has been presented at a number of national and regional conferences. Next year, the project will be featured in a panel presentation at the Conference on College Composition and Communication, in honor of its tenth year.